Share the post "Endometrial Ablation as a Fibroid Treatment Option"
Looking into endometrial ablation or other treatment options for fibroids? Read on to find out more information about these alternatives and how UFE compares. Is endometrial ablation a feasible option for treatment of fibroids? I want to know what the best treatment would be for my problem. Endometrial ablation is a process that destroys the lining of the uterus. It is most often used to treat women who have heavy menstrual periods. It may also be used to treat fibroids that are no larger than 3 centimeters. There are several ways to perform endometrial ablation. Most of them use some form of energy to destroy the uterine lining; however, not all of the methods are used to treat fibroids. Two commonly used methods are the heated balloon and a method using microwave energy, both of which aim to destroy the lining of the uterus to prevent from abnormally heavy menstrual bleeding. Fibroids that are inside the uterus, also called submucosal fibroids, can often be removed at the time of an ablation. If fibroids are in the wall of the uterus, they cannot be reached and must be treated by other methods. It is also important to note that women intending to keep their fertility should not consider this procedure. Endometrial ablation is primarily optimal for women with abnormally heavy menstrual periods that wish to lessen or totally eradicate this issue. Uterine Fibroid Embolization, however, is largely a procedure used for the treatment of fibroids. By embolizing, or blocking, the blood supply to the fibroid, UFE ensures that the tissue is incapable of receiving the blood and nutrients necessary to grow; therefore, causing the tissue to shrink and die. 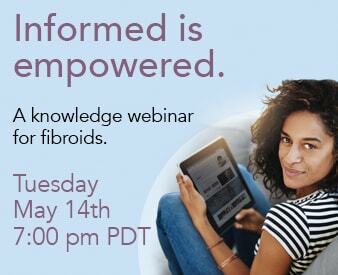 If you would like to find out more about fibroids and the embolization procedure, please feel free to call the Fibroid Treatment Collective at 866-362-6463. One of our medical staff professionals can discuss your alternatives with you and help you decide which health option is best for you.